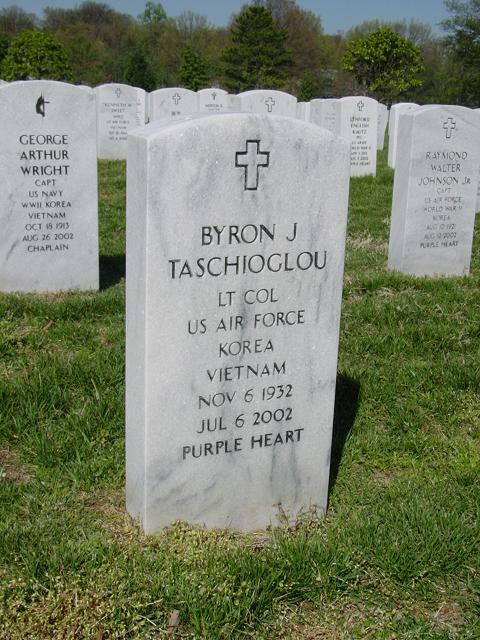 Byron Peter Taschioglou, Lieutenant Colonel, United States Air Force (retired), 69, of Plymouth and Sarasota, Florida, died Saturday, July 6, 2002 in Plymouth, Massachusetts, after a long illness. He was born in Boston and raised in Winthrop and Belmont where he graduated from high school in 1950. He attended Brown University and Worcester Academy. In 1951 he joined the U.S. Marine Corps, serving for two years before transferring to the Air Force. An airborne navigator, he flew refueling aircraft and later airborne gunships in two separate tours in Vietnam. In April 1972, of 10 crew members, he was one of the six who survived when their gunship was shot down over An Loc. He was awarded an Airman's Medal for heroism and a Purple Heart. He retired in 1973 after 20 years of service with the U.S. Air Force Strategic Air Command. Following retirement he earned a degree from the University of California at Sacramento and became the assistant finance director for the city of Vacaville, Calif.Colonel Taschioglou enjoyed cruising San Francisco Bay with his family and singing baritone in lead roles in community theater productions, men's choruses and barbershop quartets. An excellent golf putter and pool player, he was also expert at backgammon, enjoying Internet matches with opponents from all over the globe. He is survived by a son, Jon Peters of San Francisco; a daughter, Althea Hendricksen of Suisun, California; their mother, Jeanne Taschioglou of Vacaville; two granddaughters; a brother, Kemon Taschioglou of Lincoln; and a dear friend, Barbara Carver of Plymouth. A memorial service will be held on Sunday, July 21 at 2 p.m. at Bartlett Garrity Funeral Home, Plymouth. Colonel Taschioglou's ashes will be interred at Arlington National Cemetery. In lieu of flowers, contributions in his memory may be sent to The Chorus of the Keys, c/o Don Crabb, 804 Pennsylvania Ave., Sarasota, FL 34243.